I got some feedback from a post I put up on the PP forums about Butcher1’s face. The post suggested that the eyes needed reworking, which I agreed with. I had painted the eyes late at night when I was struggling to keep my own eyes working properly. So it’s hardly unexpected that I didn’t do the job to the best of my abilities initially. So I went back and repainted the whites of the eyes, and redid the pupil. Now I would like to have tried to have a coloured pupil and put a tiny dot of white on the pupil to show a reflection of light. But I didn’t feel confident enough to try and pull that off so I just used the standard technique I have been using to paint eyes for years. I could do my own graphics to demonstrate it, but there are tutorials all over the web showing this so here is a link to one (the section entitled “Easy version” 😉 ). 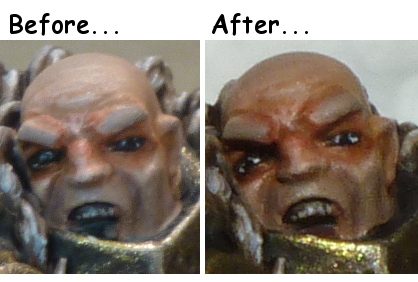 So with the eyes reworked here is a before and after comparison. I think the rework is a vast improvement. I tried to make headway on completing the model, my aim is to get it completed for Thursday night’s gaming at the club. That way ending some league points for having finished the model. A coat of Red Ink to reduce the pinkness of the final highlight and tie the colours back together. So I need to go back and fix this at some point. 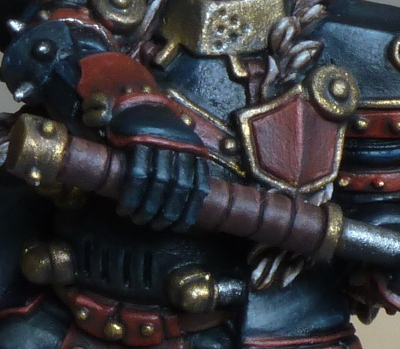 This picture doesn’t look so bad when you compare the red of the axe to that of the armour. My photography skills are not that good. I painted the axe handle, armour straps and belt, the gun holster and the gun’s handle grip all the same way and at the same time. It saves mixing up paint multiple times and allows you to have the same colours across the model. 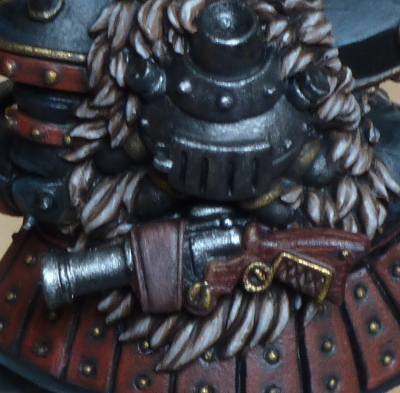 I wanted to have a leather with a slightly red tone to it, here is how I went about it. I have ended up with a leather that isn’t quite as red as I intended but I like the end result so am happy to leave it as is. For this I also wanted to end up with a reddish looking wooden colour. I definitely wanted to have a wood grain effect in the stock. This is quite simple to achieve with the following method, I am sure it could be done better but I am satisfied with the result. Gun Corps Brown base coat. Wood grain painted Menoth White Base, thin lines achieved with a small detail brush. Shaded with a couple of coats of Brown Ink. Further shaded with Brown Ink and Exile Blue mix. Again I was impatient and did not let the ink dry between coats, in doing that I have very nearly hidden the wood grain effect. Lesson now learnt be careful with inks! 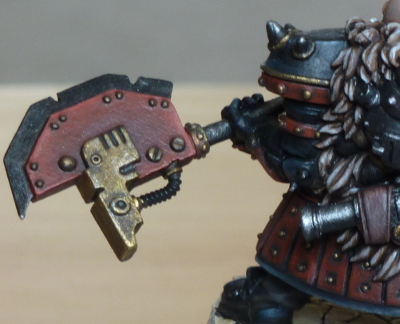 This entry was posted in Warmachine & Hordes, Work in progress and tagged Butcher1, challenge, khador, paint the target, painting, painting work in progress, tale of 2014, warmachine. Bookmark the permalink. Almost there it looks like! From the picture you have, the axe head looks pretty good I think. It accents well with the rest of the weapon. More subtlety is always welcome though, so I’ll be waiting to see how it turns out. Good luck this week in the league and thanks again for these updates. Very helpful. Cheers jimb0, I just put a coat of varnish on the model this afternoon, hope it has dried in time for this evening. I’ll get some pics up of the finished model tomorrow I expect. No work in progress shots though unfortunately.